Product review: Flying with the Birds – by Gilly, 16 Nov 14 5/5 Excellent "Arranging the date was not a problem at all the staff were friendly and very helpful. The venue was very easy to find. The facilities were ok, but I didn't go there for lunch !!! The staff were knowledgeable. Very helpful and knew their stuff to make you feel at ease. The equipment was in very good condition. The briefing was good informative and made you feel comfortable. The experience itself was great. After the event my boyfriend took a video of the flight and pictures before, during and after." When the irresistable pull of the air takes over this is the way most people choose to slate their thirst for adventure. Flying with an experienced instructor you are towed by a static winch to between 600 and 1000ft. Once released from the tow you can take control or simply sit back and enjoy the flight. As you complete a circuit of the airfield you will enjoy one of the most intense flying experiences before gliding gently to the ground for a perfect landing. 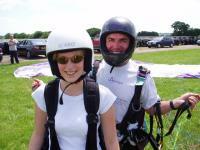 Short sharp and thrilling this is our most popular experiance flight for young and old alike. Also suitable for people with disabilities in our specially modified harness - please call for details. Participants must be no more than 15 stone with weight in proportion to height. Suitable for people with most disabilities. Arranging the date was not a problem at all the staff were friendly and very helpful. The venue was very easy to find. The facilities were ok, but I didn't go there for lunch !!! The experience itself was great. After the event my boyfriend took a video of the flight and pictures before, during and after. It was not a problem having to ring to arrange the date. The weather was not good on the first date we arranged , we rang as requested at 8.15 in the morning the message on the answerphone was not clear and we set off for the 60 minute drive, we rang when we were almost there to inform the operator we would be a few minutes late, only to be told all flying was cancelled. We rang later in the week and rebooked. On this occasion we rang and spoke to an individual, they were unsure about the conditions and we had to ring 3 times to get a frim answer.It was straightforward to find the venue and the faclitiles were fine. The staff seemed to be competent in flying but the organisation of who was doing what when was poor: it was not all clear who was in charge and there was no one to receive us in the reception area when we arrived. The competence of the flying staff was clear and the briefing was adequate for the session. The experience was a terrible let down, the website and voucher claimed an experience of about 10 minutes. Two of us experienced identical flights we had a tandem paraglide experience, we were towed up and immediately turned to descend , the first flight surprised us and our spectators so much that they timed the 2nd flight it lasted 1 min 43 seconds. This in no way amounts to about 10 minutes. I have written to the company to complain, the trip was an 18th birthday present for my daughter and was meant to be something to remember,the company did not provide what was advertised. We feel cheated. We were just dissapointed, due the the lack of clarity about who was incharge etc I was not able to take uop the matter at the time, I also did not want to embarass my daughter on what was meant to be a special treat. It was claer that we were not as important as people taking weekend courses etc but they should not accept the business if they only intend to offer less than 20% of the advertised experience. Surely this is in breach of advertising or trading standards legislation. I am very disappointed with both Flights4all and the operator. Booking in was fine, [and the site was] very easy to find. Visitor facilities were ok. Friendly staff. briefing covered all required points. Time in the air was VERY brief. I expected the ten minuets mentioned on the voucher and was totally underwhelmed by the two - three minutes I actually had. No problem with photographs .